The SGIA's board meeting held on 25th September '06 beca me the occasion for the signing of the NAMP (National Membership Plan Affiliate) between SGAI & AGIA. The Agreement between the two associations is intended to encourage transfer of information and technical know-how across continents in order to further the development of the Screen Printing & Graphics Industry in India. The agreement also ensures SGAI a seat on the SGIA Board of Directors. 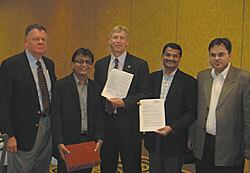 The Agreement was signed by Mr. Anil Brahmabhatt President, SGAI and Mr. Michael Robertson President CEO of SGIA.